Nike is 'working to identify the issue' after Duke freshman Zion Williamson had his shoe burst apart mid-game against rival North Carolina. Duke University is not the only one reeling after its big loss in Wednesday&apos;s marquee matchup with North Carolina -- Nike&apos;s brand legacy could be on the line. 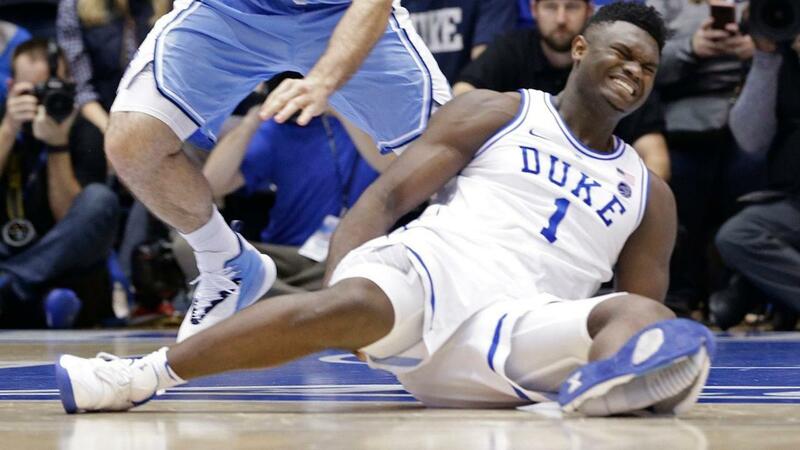 Social media went into overdrive after Duke&apos;s star player, Zion Williamson, suffered an injury after his Nike high-tops split open during a play, causing him to leave the game with a right-knee injury. “We are obviously concerned and want to wish Zion a speedy recovery. The quality and performance of our products are of utmost importance. While this is an isolated occurrence, we are working to identify the issue," Nike said in an official statement. Nike&apos;s shares fell Thursday following the incident. Puma, one of Nike&apos;s rivals, at first trolled Nike about the incident, tweeting, "Wouldn&apos;t have happened in the pumas," but later Puma deleted it. Williamson has been projected by many to be the first overall draft pick in this June&apos;s NBA draft. The Tar Heels won Wednesday night&apos;s game 88-72. After the loss, Duke basketball coach Mike Krzyewski said while they "are very concerned about Zion, it&apos;s a "mild knee sprain."